When you’re working on getting an ex back, you’re hungry for those signs your ex may return to you. Sometimes it’s very hard to tell what’s going on in an ex’s mind, especially when they are private people that don’t share much… In my experience as an expert specialized in love and relationships, I have noticed various indicators that serve as signs your ex will eventually come back. 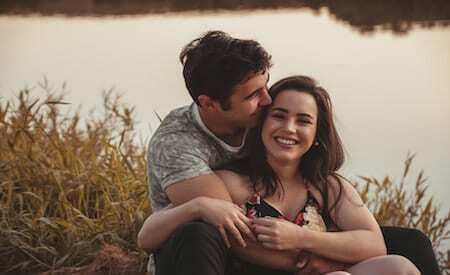 Each situation is of course entirely unique, but there are some universal signs to keep an eye out for that might mean that your ex is trying to get closer to you. Many relationships end in huge fights that are enough to make two people never want to be together again, but that isn’t the case for everyone. Truth be told, a breakup can actually serve as a catalyst for making a relationship between two people that love each other better and stronger than ever before. It can serve as a tool that highlights how deeply you actually care for one another, but also what needs to change. The fear of losing the person you love forever can be the electroshock needed to catapult you down the right road to restoring a relationship that will withstand the test of time! I wanted to write this article today to give you some insight into what to look for when you’re wondering how to tell if your ex is thinking about coming back to you! Will your ex come back? Why won’t they just tell you if they want to? I was speaking with one of my clients, Ashley, who has been working on getting back together with her ex. She has a gut feeling that her ex boyfriend is starting to come back and might even want her back already. Great news, right? If your ex is the one that pulled the plug on the relationship, it is possible that their pride is actually keeping them from asking you to take them back. People don’t like to come “crawling back” and this might be enough for your ex to keep their distance. Don’t let this make you worry though. When a person wants something enough, pride is eventually set aside and logic takes over. Another factor that could make your ex hesitant about coming back is simply the fear of rejection. Nobody likes to feel vulnerable – so you might be seeing signs your ex wants to come back before he or she actually tells you they miss you, because they’re still afraid of being turned away. An ex might be feeling very guilty about what they’ve put you through, and it might even be enough for them to try and stay away from you. I have one client tell me what she misses her ex but doesn’t dare ask for him back because she knows what kind of heartache she put him through when she left. She said he deserved so much better and that he shouldn’t have had to go through so much pain. The fact that she was the source of that pain was enough to make her hesitant about trying to get close to him again. What are the signs your ex will eventually come back? It may take your ex a while to work through negative emotions and come to the conclusion that they want you back, but when they’ve realized this, you’ll start seeing signs an ex will come back. But is there a concrete answer to “How to know if your ex will ever come back?” Well, there is no black and white, one size fits all answer to this question. Each and every one of us is unique, which means we all have our own personality traits, our own ways of perceiving the world around us, and our own wants and needs. Every situation is unique, and we cannot know for sure what is going on in your ex’s mind. That is why it’s so important to actively work on making your ex realize that you’re the one for them… but more on that later! Let’s dive into the signs your ex will eventually come back. The biggest indicator is when an ex flat out tells you they miss you and that they think that the breakup was a mistake. You can see that they clearly regret what happened and that they don’t want to be without you. They might be working up to actually asking you to get back together, but if they’ve started showing you how much they regret the fact that things ended, it’s a pretty big sign that they might come back. A big sign that an ex will come back is when they go out of their way to remain close to you. You notice that they’re making an effort to call and message you, they propose hanging out, and they’re even coming to you for advice about things that they could ask literally anyone else. They’re finding excuses to talk to you and to stay in touch. Your ex might even be proposing things like going to the movies or out for a drink together… Kind of looks like a first date, no? If “Will your ex come back” is the main question in your mind these days, think about whether or not they keep bringing up the past and positive memories to you. After a breakup, we all experience a period when warm memories surge up and outweigh the bad ones associated with the breakup. By bringing up happy memories, your ex might indirectly try to convince you that your relationship still has a chance, and that you could be happy together. Perhaps he or she is trying to make you forget the things that went wrong or the mistakes that they made while you were still together. When these types of questions come from your friends and family, they seem perfectly normal. They don’t have any ulterior motives. Nevertheless, when your ex is the one asking you these things, it’s a bit different and it might be more than just curiosity that pushes them to ask. Trying to get back together with someone that’s in a new relationship is a bit different from trying to get back together with someone who is single, so your ex might be trying to do some research that will help them to design the right strategy for winning back your heart. You’re hearing that your ex has been asking your mutual friends about you. They want to know what you’ve been up to, if you’re single, if you’re happy, and if you’ve been asking about them as well. They don’t want to be too direct… Either they’re too shy or they don’t want to blow their cover, so they go through intermediaries to find out about you. If you’re familiar with my philosophy, then you know that I always talk about how important it is to make concrete changes when you want to get back together with someone. You have to pinpoint what went wrong and come up with tangible solutions so that you don’t end up going down the same road again in the future. You both know how your last relationship together ended, so you’ve got to make sure that you protect the new relationship from it happening again. Following in line with my previous point, your ex might be realizing that you’ve made the necessary changes as well. They can see that you’ve understood what needed to be improved and you took action! Getting closer to your family is a way to get closer to you. If your ex knows how important your family is to you, and how important it is that they like you if you’re going to be together again, they might already be making an effort to get close to them again. What’s more, your family can actually be a goldmine of information about you, so your ex might be trying to find clues as to how to win you over again. Are there signs your ex doesn’t want you back? It’s true that it’s important to pay attention to signs that your ex might be drifting away from you as well – especially if you want them back. Keep in mind that the period following a breakup can be very complex and there are all kinds of emotions that are involved. Sometimes you’ll be feeling vulnerable and nostalgic, and other times you might be feeling like you’re better off without this person. Don’t panic if you aren’t seeing the signs I mentioned above – there are still things you can do to turn things around. Before we go into that, I wanted to take a moment to look at some possible signs your ex doesn’t really want you back right now. This usually happens when the breakup was very messy, when maybe you behaved in a way that made you look bad, or if your ex is in a new, serious relationship (and not just a rebound). As I said above, each situation is entirely unique so it’s also very possible that if your ex is talking to someone new, it might be a thinly veiled attempt to make you jealous. This either means that they still feel something for you or want revenge. The way to navigate this is to pay attention to the way they talk about this person. Is it sincere and respectful and are you picking up on genuine feelings for the new person, or are they talking about how hot he or she is and what kind of wild nights they share? I think you can see which situation involves an ex really moving on and an ex trying to push your buttons. People often make the mistake of thinking that the opposite of love is hate, when in reality it’s indifference. When an ex is still very upset about what happened, it means that they are still feeling something and you still have an effect on them. It’s tricky, but you can still turn the odds in your favor. When a person has seemed to move on and is no longer affected by your presence in their life or lack thereof, it is possible that they would not take the opportunity to be with you if the opportunity were to present itself. Another possibility is that you’ve fallen into the friendzone. This is especially true if your ex isn’t a shy individual that would need some encouragement before they make a move. If you want to know how to avoid falling into this trap or how to get out of it, I suggest you read this right away. Similarly, if you’re back in touch and your ex has been treating you more like a buddy than a love interest for a while now, they might be trying to foster a more platonic relationship with you. They’ll tease you and have fun, and maybe even talk about other guys or girls to you. They are relaxed and don’t feel like they need to impress you anymore… Perhaps you had a lot in common, or perhaps you were friends before the relationship, and your ex doesn’t want you to completely leave their life. If you read through the signs your ex will eventually come back above and you didn’t recognize any of them in your current situation, don’t panic. Anything is possible in love as long as you are motivated and patient. In the majority of situations, the best thing to do when you want an ex back is to cut contact with them. This goes by the name of the no contact rule, and it is one of the most powerful techniques for jump starting things – even if you noticed signs he’s not coming back. This tool works by grabbing their attention, making them miss you, and giving you the chance to become the best version of yourself. The needier and clingier you are, the less likely it is that your ex is going to want you back. What you need to remember is that if your ex comes back, it’s going to be because they realized that they miss you – not because you pressured or guilt-tripped them into it. Even if you haven’t been particularly clingy or needy, you might have been too accessible to him or her. You wanted your ex to know that you’re there if they need you, but now you’re going to do the opposite. No, you’re not at their beck and call, you have your own things going on and you’re busy. You’re tackling your own life and making it into what you’ve always wanted it to be. You’re staying busy with people and projects that bring you joy and satisfaction. You’re hitting the gym and feeling great about yourself, and your confidence is attracting other people. You’re out experiencing new things and your life seems so fun and exciting… And your ex will realize that he or she is no longer a part of it. It’s not uncommon for an ex to feel peace knowing that you’re around if they ever feel like giving it another go with you, and this puts all the power in their hands. But here’s the thing: Your ex is going to want you back the moment they fear losing your for good. You can post pictures of all the fun things you’re doing on social media, and even if you are no longer connected, word will travel back to your ex. They’ll begin thinking, “Wait there’s the person I fell in love with in the first place… and it seems like I am witnessing a new and improved version! Was leaving a good idea…?” You will plant a seed of doubt in their mind and then things will start to fall into place. Making an ex want you back is going to require patience and perseverance, but it is entirely possible. Remember, if you need a helping hand, I am here to guide you every step of the way. All you need to do is leave your question in the comments section below and I’d be more than happy to personally reply, or reach out to me directly right here. We can work together to design the perfect plan of action for your specific situation, even if you aren’t seeing signs your ex wants to get back together right now!